It should come as no surprise that there’s a strong positive correlation between the number of licenses being approved and the increasing competition among dispensary owners. It’s no longer enough to supply customers with cannabis. Retail experiences that leave a lot to be desired will only continue to survive for so long, as savvy brands are poised to leapfrog them… if they haven’t already. These successful dispensaries are investing in the customer experience, from the design of the store to educational resources to the level of tech one would see in any other retail environment. They are seen as cannabis advocates who care deeply, not only just about their customers but also the community in which they operate. Their willingness to shed the old school “pot shop” vibe is paying off in big ways, for their bottom line as well as the progression of the industry as a whole. We asked some of the top designers in the industry about the importance of a well-designed retail environment in the cannabis industry. Here’s a quick look into each of their backgrounds and why we thought they were just the right experts to ask. In Part one of our three part series, we asked Jennifer Culpepper about some tips and insight she could share. Jennifer Culpepper is the founder and owner of Brand Joint. She is known for being an exceptional brand strategist and advisor to entrepreneurs who are looking to grow successful cannabusinesses. “Paying more attention to small details can help to spread brand awareness, enhance customer experience and differentiate from competitors,” said Culpepper. What is an often overlooked design element for dispensaries? Jennifer: It’s not necessarily a specific element that’s overlooked but, more often, the failure to create a strong brand foundation. Design should have a clear point-of-view and purpose. Does your brand effectively communicate its values, connect to its target audience, and do it in a way that’s memorable? That brand self-discovery needs to take place in the beginning stages of brand development. In your opinion, is there a common design element that should be avoided? Why? Jennifer: I don’t usually live by design “do’s and don’ts” because I think all rules can be broken if done intentionally and thoughtfully. That being said, I try to avoid anything that’s super popular or cliché, because it’s hard to differentiate your brand from others if they are all following similar trends. As designers, we tend to pull from our past experiences for inspiration. With the internet at our fingertips, it’s easy to get overwhelmed and swept up in trends. I can’t stress enough how important it is to stay true to your brand and your dispensary — not follow what you’ve seen other brands doing. What part of the design process do you like best? Jennifer: I love the Brand Discovery portion that takes place at the beginning of each project we take on. I sometimes refer to it as Brand Therapy, because it often feels like a therapy session — we sit on the couch and just get down to the heart and soul of your business and brand. I am someone who asks a lot of questions all the time, so it’s a natural fit for my personality! I consider Brand Discovery the most important part of any design process. This is the foundation for which the whole brand is built. The creative exploration phase follows Brand Discovery, and that process is always fun for the whole team. We do a lot of research, create mood boards, then we let our brains loose and get to be as wildly creative as possible. Jennifer: Whenever we have good synergy with our clients, that’s when the most successful design is achieved. It’s hard to choose a favorite, because each one is unique and meaningful. It’s always exciting to watch the projects grow into successful brands over the course of months and years. I am very proud of the work we’ve done for developing Prime Extracts, a brand of cannabis concentrates in Maryland. Starting from the very beginning with name development and brand positioning, we created a beautiful line of packaged products that has gotten a lot of positive feedback for both the quality of the product and the packaging design. Our work for National Holistic Healing Center has also been very rewarding. We helped to brand this dispensary when it first opened. Since then, it has become the largest dispensary in D.C. We’re now using that foundation work to launch a new line of medical CBD products that fall under their brand. It’s pretty amazing to see how this dispensary is evolving so organically. 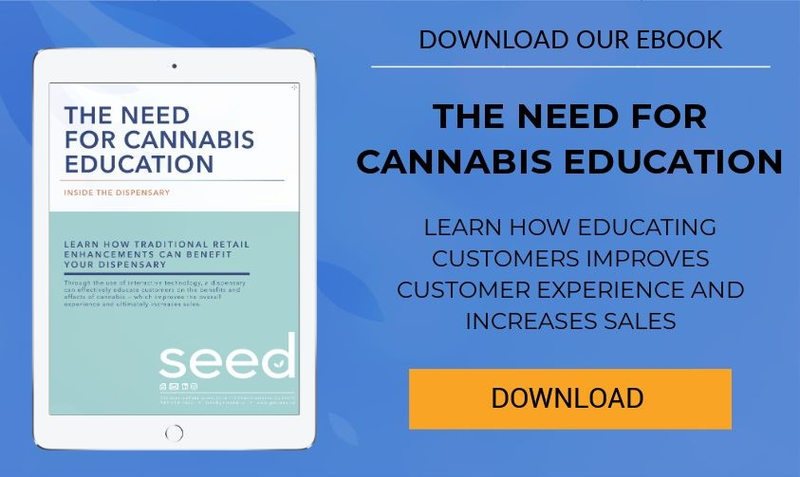 To learn more about dispensary design and delivering experiences that educate consumers and turn them into loyal customers, check out our recent eBook.